Incourage’s CEO Kelly Ryan (center, left) and Jenny Harms (center, right) with Housing & Urban Development (HUD) Deputy Secretary Nani Coloretti (left) and Council on Foundations CEO Vicki Spruill (right). (Wisconsin Rapids, WI, April 11, 2016) – Incourage has received a 2016 U.S. Department of Housing and Urban Development (HUD) Secretary’s Award for Public-Philanthropic Partnerships for its Blueprints for Tomorrow (Blueprints) program. 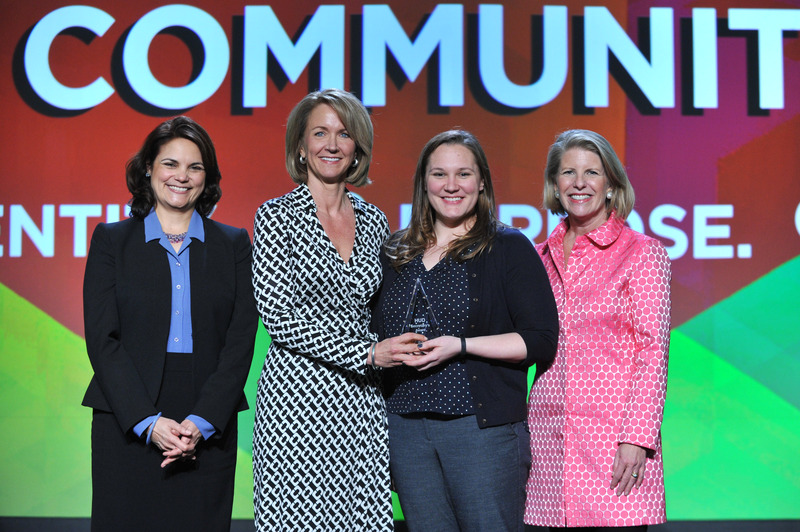 The award, a national partnership between HUD and the Council on Foundations, was presented April 10 at the Council’s Annual Meeting, in Washington, DC. 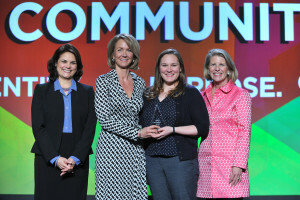 Incourage CEO Kelly Ryan accepted the award. Blueprints is a 25-month Incourage and USDA-supported program combining training, coaching and community knowledge with evolving design and finance tools, to achieve together, projects that support community priorities. It is building networks, vision and skills to lead a new regional economy based upon the values of equity, opportunity and shared stewardship, according to Incourage CEO Kelly Ryan. The six organizations participating in this initial Blueprints group include: City of Wisconsin Rapids; Wood County; John E. Alexander South Wood County YMCA; Wisconsin Rapids Housing Authority; Central Rivers Farmshed; and through additional organizations investments, Incourage. These organizations were identified because of their projects and for their appetite for collaboration and entrepreneurial spirit, Ryan said. “There is a tangible feeling that any project coming out of this collaboration has a stronger chance of real world success,” said Adam Tegen, City of Wisconsin Rapids Director of Planning & Economic Development. Tegen highlighted the partnerships that are emerging from Blueprints training as teams are look beyond their own priorities to see how they mesh with other teams and the community at large. The 2016 U.S. Department of Housing and Urban Development (HUD) Secretary’s Award for Public-Philanthropic Partnerships is a national partnership between HUD and the Council on Foundations. It recognizes excellence in partnerships that have both transformed the relationships between the sectors and led to measurable benefits in housing and community development, including increased economic development, health, safety, education, workforce development, sustainable communities, inclusivity and cultural opportunities, innovative regional approaches, and/or housing access for low- and moderate-income families. The award calls attention to philanthropy’s work with government at all levels and highlights transformational partnerships across the country that are key to community development. Established in rural Wisconsin in 1994 to serve the changing needs of the south Wood County area, Incourage has become a nationally-recognized leader in place-based philanthropy and community development. Guided by values of equity, opportunity, and shared stewardship, Incourage envisions a community that works well for all people. One physical manifestation of this vision is the Tribune, which demonstrates Incourage’s resident-centered approach to growing a strong and inclusive local economy. To learn more, visit incouragecf.org.